Having just returned from the airport by cab, I have been moved to rant about how ridiculous it is for Los Angeles taxi cabs to pick the American dinosaur Ford Crown Vic as a cab. It’s a large sedan, with a big engine, and many cab operators buy them as used vehicles from the police, so the Police Interceptor version is a veritable rocket ship dragster. But in taxi guise, the partition that keeps the driver safe from potentially violent rear-seat passengers also takes away the rear seat legroom. 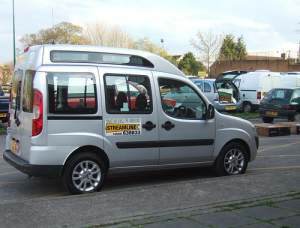 A Fiat Taxi in England - small outside - roomy within. Tall people have no way to place their feet on the floor without twisting them to the side. Only two normal adults can comfortably stand a short ride on the hot vinyl seat in the back of a Crown Vic cab. The particular cab that we took from LAX also had a propane conversion. Nice for the environment you say? Well that propane tank has to go somewhere, so only one suitcase could fit inside the trunk, and our second bag had to go in the front seat beside the driver, obscuring his view of the right-side mirror. Our flight originated in the UK where all kinds of economical, sensible vehicles are used as working cabs. All of which are able to take four adults and their luggage, and none of which have any issues with steep hills, motorway speeds etc. The American taxi industry seems to have lost the plot. if you had to choose the worst possible passenger vehicle to use as a cab, it might very well be the exact one they have chosen. Everything you write about transport, cars, scooters etc. is of great interest, and grabs my attention. More please, and with pictures like in the old system. Absolutely. I get claustrophobia in these horrible taxis. They may as well handcuff us to the seat. Sometimes you get a minivan like a Dodge, Chevy or Ford, which is much better, except they may not offer the same crash protection as the converted police car. I’m with ya man. I’m taking the shuttle van from now on. So I may have to stop at another rider’s home on the way, but it’s a nice new clean van. Bigger, cleaner, better. A crownvic with a partition, bizzaro world baby. Ford actually made a “Taxi” version of the P71 police interceptor. Most established taxi companies purchase these as opposed to the police cars. The ford “taxis” are actually 6 inches longer and is stretched behinfd the driver seat. Plenty of leg room. As for the car… well mine is a 2007 Ford “TAXI” and currently has 253,000 miles and running strong. Very few auto makers can accomplish such durability. That’s why they are chosen for severe duty work. Thanks for your info Jmarinello. Clearly Los Angeles cab operators can only get their hands on the shorter, former police cars, but now that 2 or 3 years have passed since the article, I can happily report that several alternative vehicles have been introduced and the percentage of old police cars is dropping, especially on the safer day shift. It is unfortunate that conditions in L.A. require a safety shield. The Crown Vic without one has plenty of leg room and has been the workhorse of our fleet for years. The company you rode with obviously didn’t do the full conversion, which allows the propane tanks to be mounted underneath. We are concerned about the future choices we have to make soon. That Fiat looks really roomy, but I doubt the majority of our customers will want to pay the price it costs to ride in one. We get as many as 450K from the Vic; the throw away, bic lighters, they are producing today are garbage at 100K.